Victor Berezin was born in Kiev, Ukraine in 1960. Victor has been playing Chess since he was 11 years old and has reached the title of FIDE Master with a rating of 2370. 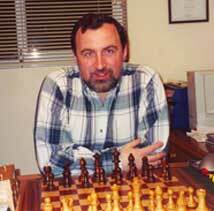 In 1995 Victor travelled as a Chess coach to the last Inter-zonal in Kisheinev, Moldova. After this major event Victor decided to leave his chosen career to become a full-time Chess coach.